Are the Big Banks Putting a Gun to the Head of the U.S. Consumer – Again? ← Was Robert Mercer’s Vast Operation to Put Trump in the White House Just About Tax Avoidance? Last Thursday, President Trump told a union crowd in Ohio that the U.S. is enjoying “the greatest economy we have ever had.” If that is so, why is Trump piling on more national debt to boost the economy through fiscal spending? The answer appears to rest in the fact that much of the economic growth in the United States is being financed by consumer debt. The serious threat to that economic growth is that interest rates are rising on big chunks of that consumer debt with virtually no restraints on what the mega Wall Street banks can charge to struggling Americans. According to the 2017 year-end study on “Household Debt and Credit” from the Federal Reserve Bank of New York, household debt has increased for 14 consecutive quarters and now stands at $13.15 trillion, an historic milestone that eclipses the former peak of $12.68 trillion that occurred in the third quarter of 2008, in the midst of the greatest financial crash since the Great Depression. The report notes two troubling trends: credit card balances that are more than 90 days delinquent have “been increasing notably from the last year” and student loans that were 90 or more days delinquent or in default in the fourth quarter of last year reached 11 percent of student loan debt outstanding. The most recent report from the Federal Reserve on consumer debt (excluding debt tied to real estate such as mortgages and home equity loans) raises more alarm bells. That report shows that from the end of 2013 to the end of January 2018, consumer debt went from $3.095 trillion to $3.855 trillion on a seasonally adjusted basis. 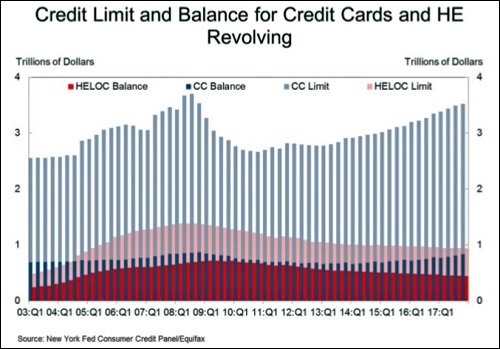 Approximately one-quarter of that debt is on credit cards and the interest rates on those credit card debts are rising dramatically with no restraints being placed by bank regulators or Congress. At the end of 2013, the average interest rate being assessed on credit card accounts was 12.95 percent according to the Fed report. As of November 2017, according to the latest data released by the Fed, that rate had increased to a whopping 14.99 percent, which is a full percentage point higher than six months earlier. For an already tapped out consumer, this kind of credit shock presents both a direct danger to the U.S. economy and an outrage to the American public that belatedly learned in 2011 that these mega banks had been bailed out by the Fed to the tune of $16 trillion in almost zero interest rate loans during the financial crisis. “It is wrong that millions of Americans are paying credit card interest rates of 20 or 30 percent. “The Bible has a term for this practice. It’s called usury. And in ‘The Divine Comedy,’ Dante reserved a special place in Hell for those who charged people usurious interest rates. While the Fed reports show the average interest rates being charged on credit cards, it is still true, as Sanders says, that millions of Americans are paying credit card interest rates of 20 percent or higher. No society that values the equitable distribution of wealth or the well being of its citizens should ever tolerate these kinds of poverty-inducing interest rates. The same mega Wall Street banks that are being allowed to charge 15 to 20 percent on credit cards are holding trillions of dollars in U.S. deposits on which they are paying less than two percent interest. These deposits come cheap to these banks because they are FDIC-insured, a Federal program that is backstopped by the U.S. taxpayer. Why should the mega Wall Street banks be receiving a taxpayer subsidy on their deposits while ripping off the American public with onerous interest rates. It’s an insult to the democratic ideals of representative government that Congress allows this predatory financial system to survive and prosper.